Once you get a grasp on web development, you will wonder if there is an easier way. How can I update all my pages without actually changing the code? You will find something called a content management system. Using an open source content management system, you can manage all your content without modifying your code. 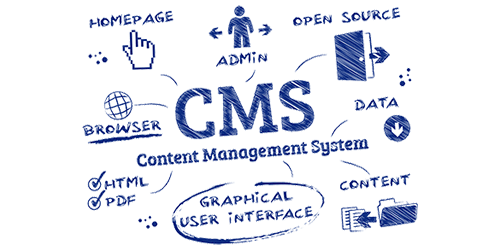 A content management system or CMS is a software application used to manage frontend content. This could be your articles, images, or various digital media. Using one can have a huge advantage when your are thinking big. If your website has more than 20 pages, you probably want to start thinking about implementing a CMS. Having a CMS manage your content you can then change any front end media without alternating the code. This is useful if you have moderators that don't know any web programming languages. The only coding that is required is the physical layout and design or your site. This again is all controlled by one template page that will control the whole site. Not only does a CMS help manage your content and digital media. Choosing an open source platform gives you a whole community of themes and plugins. Themes control your design of your site. This includes everything from layout, font family and size, to colors. Having a pre-built theme will save a lot of time or headaches if you don't have much CSS experience. Plug-ins are enhancements you can give to your site. If there is a feature that you would like on your site, most likely someone has a plugin for it. Here are the most useful plugins that developer use on their content management systems. There is a lot of buzz about the which is the best CMS. Each one of them has their strength and weaknesses. It comes down to what matters to you. One plus side to staying with an open source platform is the community. If you need some help you can reach out to the vast array of forums and blogs for help. Plus with the huge communities finding plugins and modules to help you customize your blog are not far away. These three CMS are on the top of the market now. All of them will run efficient functional websites and have a huge community base behind them. Drupal, WordPress, and Joomla. Drupal is the barebones open source content management systems. It gives you everything to get going and leaves the rest up to you. This also makes it the hardest one to learn. The plus side is you will get a fast and clean application. Without much bloatware, applications you will probably never use. Drupal is the most flexible for developers and the closest to SEO friendly out of the box. WordPress is the most popular CMS hand down. It started as an online application that you would host off their server and use their domain name. But now it has an open source content management system for anyone who wants to use it. WordPress is the easiest to jump into. Within minutes you can have installed and writing content. WordPress also has a huge community for help and plugins. This can help you get out of a jam and take your website to its full potential. Anything you can think of, someone has made it for WordPress. Joomla CMS has a lot of features out of the box. It has a beautiful administrator backend. Robust category and sub-categories organization. Create, edit and manage all menu systems with url aliases. User management system, news feed, polls and search all included. All of these open source CMS will work for whatever type of business or site you are working with. The only thing you need to be concerned with is the learning curve. It does take some time to understand how they work and how to manipulate them. If you are planning on creating an e-commerce store you may want to look elsewhere. These CMS do have shopping cart integrations and are pretty good. I would recommend getting a cms designed for e-commerce. They are open source and don’t have any support, only online communities. Try them out on a development environment and see how each one of them work.